Fan controllers have their roots deep in the enthusiast community. For a long time, many people have devised various methods of ensuring their PC's run quietly during periods of low usage but cool themselves appropriately during periods of high use such as gaming. From these custom units, as with many other aspects of PC modding, a range of commercial products have sprung up. Perhaps the first really fancy one was Macpower's Digidoc 5, which we reviewed ages ago here. This product had its share of pros and cons, but was fiddly and a little cumbersome in how it controlled the speed of fans. The idea was sound enough, using a thermal probe to control the speed of an associated fan, but in reality what most people really want is a simple knob they can turn to control the speed of fans themselves. It's interesting that, after a brief flirtation with more intelligent solutions, the market seems to be returning to manual fan control. 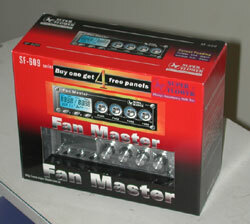 A new product embracing this fairly simple concept is the SF-609 Fan Master from Super Flower in Taiwan. 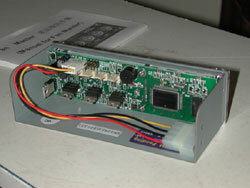 This unit allows you to monitor four temperatures and manually control four fans via simple knobs on the front. However, Super Flower are attempting to distinguish themselves from the rest of the market by paying attention to the aesthetics of such a unit. More than one person mangled their DigiDoc in order to retain the functionality but hide the faceplate when it didn't match their case. Super Flower are hoping that with their Fan Master unit you won't need to. There's a fair few goodies tucked away inside the Fan Master's box. First of all is a bag containing four black leads with thermal probes on the end. These are pre-labelled: HDD, CASE, CPU and one is blank. In reality you could monitor whatever you liked with them, perhaps the radiator in a watercooled system, the back of your video card and so on. Also included are four fan extension leads, to connect fans to the back of the Fan Master. These are 3-pin connectors only, so molex-powered fans will require an adapter. Fans with long 3-pin cords can be connected directly to the Fan Master. Also provided is a manual, or rather a folded A4 sheet with instructions in Chinese and English. This does a pretty good job of describing how to use the basic features of this product but doesn't go into much detail. Realistically, it's not brain surgery and I doubt most people will do more than glance at the instructions anyway. The last included item is a small bag containing 4 fine screws for mounting the unit into your case, 4 strips of sticky tape to mount thermal probes to things of interest and two small black nylon cable ties to keep things tidy. The "disembowelled by a Samurai" look that my PC sported during the fitment of the DigiDoc is best avoided in the interests of airflow. Finally, also in this bag are two allen keys for removing and replacing the screws holding the faceplates on. 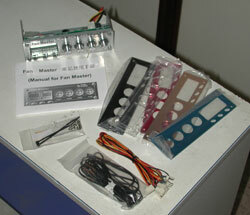 The Fan Master shipped with a silver faceplate, but several more are provided to help the Fan Master match your case. In total, five colour options are provided: black, champagne, red, blue and the silver one shipped mounted to the unit. The final included panel is another clear one, this time with white writing. The one mounted to the unit as shipped, over the silver faceplate, has black writing - which would not be readable on the darker coloured faceplates. 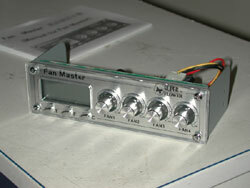 On the front we have four knobs to control fans, an LCD screen for displaying temperature and fan information and 3 buttons to select the various LCD modes. Inside the back of the unit you can see the four 3-pin fan connectors and the small block of jumper-like connections for the thermal probes. The whole unit is powered by a normal 4-pin molex connector.